The GIGABYTE X99 SOC Force is one hell of a good looking motherboard. Form the outset with the Formula 1 themed packaging this motherboard screams speed. When we first saw the X58 orange and black theme we fell in love with the looks and so welcomed a return of these theme but now with extra highlighting and orange LED's built into the motherboard, the best just got better. It is simply stunning to look at. Beauty can be deceiving though as many motherboard manufacturers put so much thought into the aesthetics that they forget what the purpose of a motherboard is for. GIGABYTE thankfully have not and their purpose is clear: Overclocking. To this end GIGABYTE have got it covered and by covered we mean absolutely smothered! There really isn't much more we could want from an overclocking motherboard save for a couple of insulated copper pots and a truck load of LN2. Clearly GIGABYTE have thought about the overclockers needs and that this board will not only be used inside of a case by the regular enthusiast but also by the extreme overclocker. To this end, GIGABYTE have thoughtfully provided a bracket that screws onto the motherboard to hold the GPU straight up so if you are using a test bed or simply a rubber mat, the SOC Force will still have rigidity to prevent the GPU from flopping aroun inside of the PCIe port. Then there is the BIOS. You can even have eye candy or basic but in-depth functionality. Whichever option you choose, the BIOS is as extreme as it is going to get. The on-board switchgear is nice and while we would have preferred better labelling (especially for the reset button) and perhaps better functionality, they will be very welcome to those using a testbed rather than a PC enclosure. Overclocking may well be the flavour of the day here but that isn't to say you couldn't use it as a general PC. It retains pretty much all of the features other X99 motherboards have such as m2 sata, 4 way CrossfireX/SLI, SATA Express, AMP-UP audio capability and a host of other mainstream features so you shouldn't be left wanting. There are a few feature trade offs such as a single LAN port but nothing that will be terribly missed or inhibit this motherboards ability to function in an 'everyday' PC. To summarise, the X99 SOC FORCE is a massively capable overclocking motherboard that isn't so much a stripped out Formula 1 race car, it is so much more than this. It is more akin to a Bugatti Veyron: Extremely powerful and extremely fast, stands out from the crowd while retaining most of the toys you would expect from a flagship product. For this reason we are awarding this product our Gold and Performance awards. If you are serious about overclocking, you need to get this motherboard. 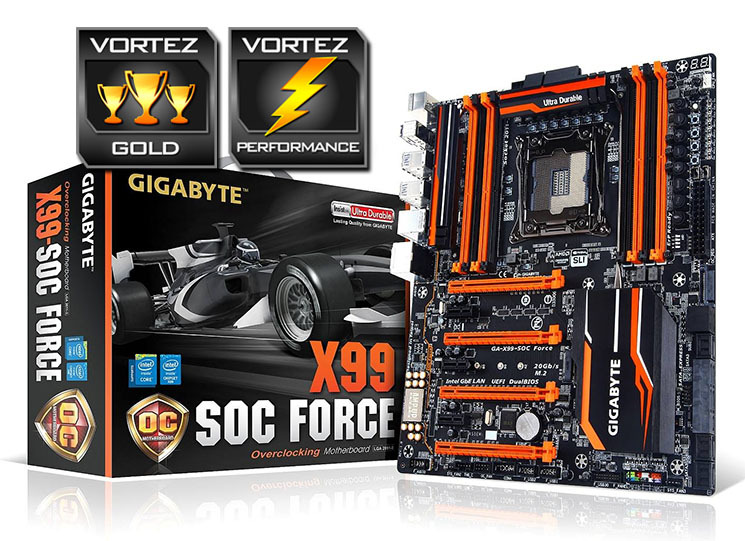 You will not be disappointed in what the GIGABYTE X99 SOC FORCE has to offer.